No! No! A Thousand Times No! 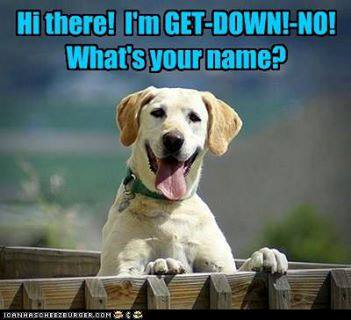 Does your dog think his name is “NO” because you are always saying, “Get down! NO!” or “Stop pulling! NO!” or “Stop barking! NO!”? A thousand NO’s do not teach your dog a thing! Stop thinking about what you don’t want your dog to do. Instead think about what you WANT and then teach and reinforce it! Try to take the word “NO” out of your vocabulary. Dogs do not know what they should be doing unless we teach them. Teach your dog to sit for greeting and there will be no jumping on people. Teach your dog loose-leash walking and there will be no pulling on the leash. Teach the “quiet” cue to stop excessive barking. There are many resources available to help you teach your dog the behaviors you want using positive reinforcement and clicker training. I have listed some of my favorite books and websites below. Joining a training class is a great way for you and your dog to learn with the guidance of a teacher and make new friends with people who share your love of dogs and can be a good support group. Find a training program which is based on positive reinforcement and clicker training. This science-based and proven method of training makes teaching the behaviors you want fast, easy and fun for you and your dog. Ask lots of questions about training methods and equipment used, get references from previous students, and ask to observe a session before signing up for any class. If a trainer uses choke, prong, shock collars, e-collars or any force- or dominance-based training you should run – not walk – away immediately. These methods can create anxiety, fear and sometimes aggression. They may seem to work short-term but often create more serious behavior problems and at the very least damage the human/canine bond. Would you go to work every day if you didn’t get a paycheck? That paycheck is your motivation. All living things need motivation to do something. That motivation should be rewards – not fear or pain. People who say using rewards is simply bribing a dog show that they do not understand the operant conditioning theory. FOR THE LOVE OF A DOG – Patricia McConnell, Ph.D.